Welcome to Monday, friends! How was your weekend? We wrapped up some swim lessons, headed out to the blueberry fields for a second harvest, buried our first family pet (RIP Violet the fish), and the hubby and I had a few hours to ourselves for a much-needed date night. Typically we manage a monthly date night, but with the busy-ness of summer, we had let the time slip by. So, bring in the lovely neighborhood babysitter, Mommy and Daddy are headed out. We tried out a new-er local restaurant which specializes in hyper-local cuisine, and it did not disappoint. Date nights are always such a joy, and summer date nights are my favorite. The dresses, the heels, and even the touches of floral goodness. I'm a flower-in-your-hair kind of gal, and I can't resist popping a fresh rose in my pulled back locks to add an extra touch of special to a night out together. 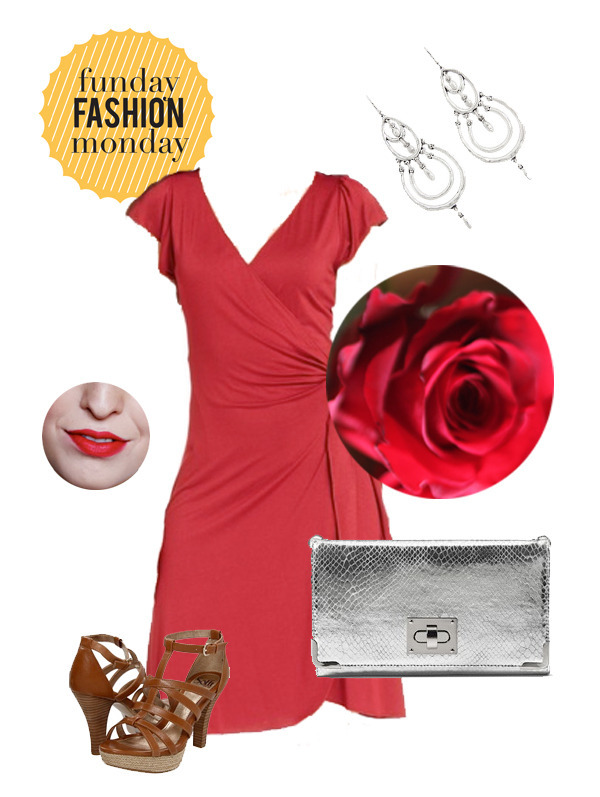 That dress: Call me boring, but a little red dress is still a great go-to for flirty fun. I love wrap dresses, and this one is so easy and affordable...I couldn't say no. Those earrings: Simple, silver sparkle that stand out enough without stealing the show. That clutch: Snake-embossed. I can't handle too much, but if you make it silver and sleek, it kind of makes any outfit complete. The perfect red lipstick: I'm a new fan of red on the lips. I've been pretty much scared of it until this summer when I finally felt like now might be the right time to give it a whirl. I'm a fan of orange-reds right now. How about you...is red too much? Those shoes: When I'm wearing a bold color, I like the shoes to play a lesser role. For summer I'm drawn to tan/flesh tones, and these sandals have the height that I like. How about you, friends? What are your key pieces for a summer dinner out with the one you love? Welcome Monday! 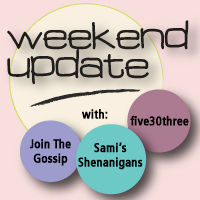 How was the weekend, friends? Were you able to celebrate Dad a bit? We celebrated C's birthday with her friends, and headed to the country to see our first drive-in movie theater!! It was so much fun and a wonderful way to soak in a great Father's Day. I'm delighted for our second Funday Fashion Monday (did you see last week's apparel/gear/toys for heading to the beach? ), and this week we're taking an afternoon out. I spend summers in skirts and dresses. I know this because little L, when he saw me in pants last week said, "Mommy, why you wearing Daddy's pants? He lets you wear his pants?" Ah, yes, so it had been over a month since my legs had been covered, and I too was feeling strange about it. Thanks for getting me back in line, L.
1. This dress: In my books, symmetry is overrated. Take these fresh stripes out for a stroll. 2. That hat: I think I've pinned almost a dozen summer toppers to date. Hats, hats are everywhere for summer, and why not? Save your head from sun, fight off bad hair days, and look like that hipster you are (or want to be). The weave in this one totally caught my eye. 3. Those shoes: Sandals! The best of the summer flat. These are in a fun hue that's bright enough to be interesting but tame enough to coordinate with the rest of your closet. 4. That bag: As a momma of three, I need to be able to carry everyone's drinks, snacks, and that precious toy (that we really didn't have to bring along because now Mommy is carrying it). This woven green number is large and styled just right for an afternoon trip. 5. This bottle: Let's stay hydrated! This bottle is not made from plastic, and it has a strong gripper exterior. Let's just say you'll look like a tall glass of water drinking from this one. And your water will taste better, too. 6. That blanket: My favorite of the group. We have one just like this: waterproof, thin, portable w/strap. We use it everywhere because you never know when the moment to picnic will strike, so go ahead and slip this into your big tote. 7. Those baubbles: I love a statement piece and luckily I'm now trendy. These wooden chunky strands are just enough heft to contrast with the light and airy assymetrical. 8. That camera: Any summer afternoon out has to be well documented, no? Did I tell you that I just got one of these? I am SO excited to dig in and learn all there is to know about a DSLR. All of my photos here are from my phone (oh, I still love you) and my older point-and-shoot. I'm moving up in the photography world, and I'm ecstatic that I can upgrade the photos offered here and in my personal albums. Now to craft me up a kickin' camera strap...I feel a DIY coming on. **Just a note on fashion/product posts. I'm not sponsored or endorsed by any of these companies. I love to window shop (my mom and I used to make this a serious hobby). I also don't want to give you the impression that Pars Caeli is about materialism or the need for "more". Art and beauty reveal the Divine. These posts include things that I admire and that, in large part, I've used...so consider them good fodder for fashion conversations around the virtual water cooler. Whenever possible, I find the thriftiest (best quality) versions of great looks around. With the exception of the camera (and the dress at $65), all of these finds are well under $50. Thanks for popping over on this wonderful Monday! Stop back this week for some summer goodness.